Globe Telecom is offering free calls into the "Libreng Tawag" stations in Pampanga and Pangasinan which were severely affected by the "habagat" to help the residents who need to assure if their families and friends are safe or do need aid if necessary. 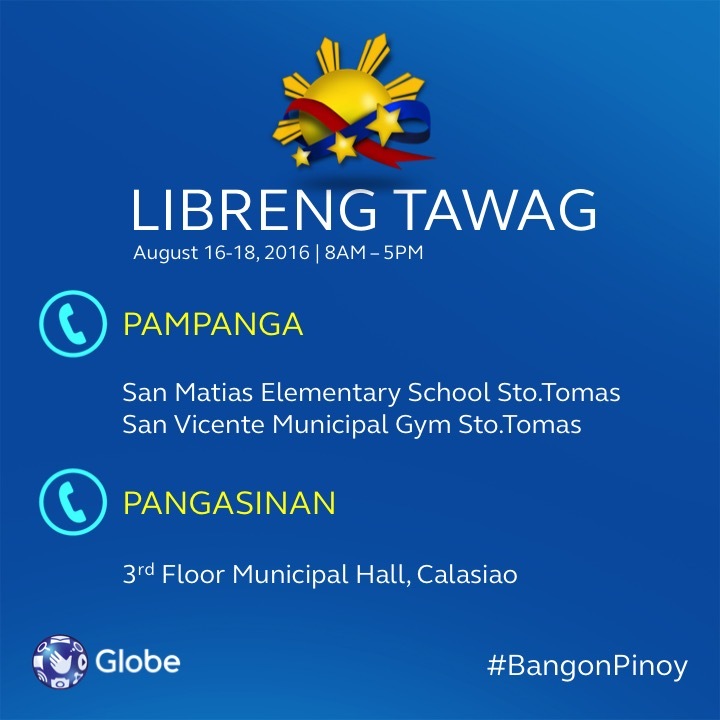 Globe Libreng Tawag is available starting August 16 to August 18 from 8AM to 5PM at the 3rd floor of the Calasiao Municipal Hall in Pangasinan, and the San Matias Elementary School and San Vicente Municipal Gym in Sto. Tomas, Pampanga. These areas are the ones being used as temporary evacuation shelter of 900 families. The Pangasinan and Pampanga are the two main areas in Luzon which is affected most by the weather as most parts are submerged in floodwater a result by the heavy rains caused by the southwest monsoon over the last weekend. Globe, through its Bangon Pinoy program is helping Filipinos affected by disasters by providing communications facilities and relief operations.